I'm not sure what I think about the addition in the film of Gollum framing Samwise for the loss of the rest of the food. It does incorporate some of the better lines we'd otherwise lose, and gives us action instead of more walking and huddling. But it unconvinces me, parts feeling out of character and overacted. The best parts are carried by Sean Astin, and I say that as someone who is usually a great fan of the life Andy Serkis brings to Gollum. We've started entering the part of the film where I just really don't care about Frodo... it's just so much forced angst and a permanent look of nausea. Seriously, I keep expecting Elijah to vomit. Side note, is it just me, or is Frodo's hair awfully fluffy and luxurious for someone roughing it? My hair would be half flat to my head and the other half sticking up in a squirrley faux-hawk. Interestingly, we don't get the penultimate chapter of The Two Towers until scene 29 in The Return of the King. Looking back at what we've watched so far, much of the stronger parts of this translation do not feature the Ring or the Ring bearer, with instead a narrative focus on the adventurous heroics rather than the descent into darkness required to save the world. This shift isn't new to The Return of the King, but it feels more marked as we start the final movie. One thing we do gain from the splitting of Sam and Frodo is a more realized sense of betrayal within the lair, and much of the lair is well built to inspire disgust and fear. 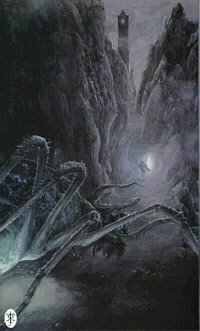 Unfortunately, for me, Shelob only half succeeds. At times she succeeds in instilling arachnid-inspired chills, but parts seem almost comical and a level of fear is almost lost by the visual reveal.